Significant Digits: A lab reinforcement activity that teaches students the importance of significant digits in scientific measurements. Appropriate for physical science, chemistry and physics students in grades 9 - 12. 1. To observe how accuracy of measurements is dependent upon the instrument or equipment being used. 2. To understand how significant digits are used when making measurements. 3. To reinforce student knowledge of the rules of significant digits. This lab is a fun and easy way to reinforce the concept and rules of significant digits and how they are used when making measurements. 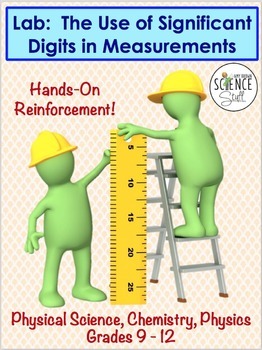 It is easy to set up, clean up, and provides hands-on experience and practice to your students in how significant digits are used by scientists when making measurements. What is included and what will the students be doing? 1) A five-page handout for the student that is ready to be copied and passed out. 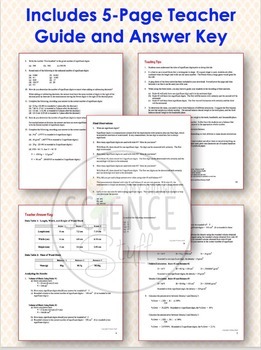 A five-page handout for the instructor containing answers and teaching instructions / tips. 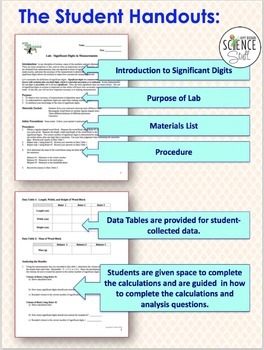 2) Student handouts include title, introduction, purpose, materials list, safety precautions, procedure, data tables, "analyzing the data" section, and final observations. 3) Students will make measurements using instruments of various precisions and accuracies. All measurements will be made using the correct number of significant digits. Students will use these measurements in various calculations and calculate the percent error. 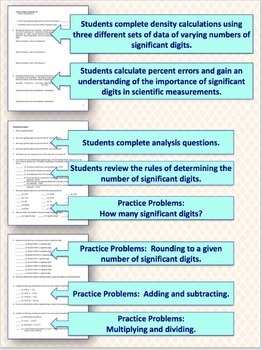 4) Students will answer questions about the rules of significant digits. 5) Practice problems are provided: Students will determine how many significant digits are in a measurement, students will write numbers to an indicated number of significant digits, students will round numbers to an indicated number of significant digits, students will add, subtract, multiply and divide numbers and report their answers to the correct number of significant digits. 6) Complete answer key is provided. 7) Instructor pages include directions for the teacher and teaching tips to make the implementation of this activity more efficient and more effective for the students. 8) The "handout from your instructor" showing three different rulers that was mentioned in the materials list is included in your download as a jpeg photo.